Please choose your state on the left hand side of the page to find a Attic/Crawlspace Insulation Removal professional in your area. Attic Insulation removal is something that should only be done by a professional company, the dangers of removing contaminated insulation from a cramped attic are great. From the diease, the itchy insulation, the falling hazards associated in walking in a unplanked attic and the wildlife that may very well still be there. Our Professional team have developed a safe, effective procedure for removing soiled insulation from attics or crawlspaces. Using commercial insulation removal Vaccuums are able to remove all of the insulation and other contamination in an attic WITHOUT any of it traveling through the living space of the home. This ensures that none of the dust, debris or animal feces in the attic makes its way down into your house. This is the safest and most practical way to remove old insulation from an attic. 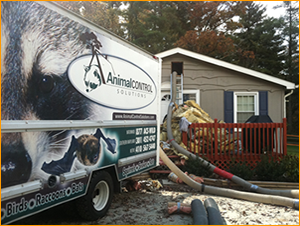 We often see attics that are totally polluted with animal feces from squirrels, raccoons, bats and mice infestations. In many of these cases the feces and urine deposits often create strong odors which can be hazardous and make the home unsafe and unhealthy to live in. Call one of Our qualified companys today to get a complete estimate to have your attic insulation removed and replaced today! Some Of the things that can live in your attic insulation include Squirrels, Bats, Rats, Birds, Snakes, Raccoons and many other wild animals that may make your attic their home. With these animals comes their mess. Urine, Feces and other unmentionables that the animal brings into the attic of your home. The follwing is a partial list of some of the things that can be found in your attic Raccoon Roundworm: Baylisascaris procyonis (Nematoda: Ascaridoidea) , is a well-known cause of visceral, ocular, and neural larva migrans in humans and other animals. Fatal or severe central nervous system (CNS) disease from B. procyonis has been reported in >90 species of birds and mammals additionally 13 known cases of neural larva migrans were reported in humans, primarily in children and Adults over the age of 55. Histoplasmosis: Histoplasmosis is a disease caused by the fungus Histoplasma capsulatum. which can be found in Bird and Bat Feces. Its symptoms vary greatly, but the disease primarily affect the lungs. Occasionally, other organs are affected. This form of the disease is called disseminated histoplasmosis, and it can be fatal if untreated. This is disease can be transmitted thru bird and bat droppings, if you get in your attic and disturb the Droppings the spores are sent into the air which is breathed by you. Never get into a contaminated attic without a respirator!! Once all the Contaminated insulation is removed from your attic and the area is sprayed and Disinfected. it is then time to have the attic checked for chewed wires, additional droppings and feces, entry and exit points created from the animal infestation, and check all truss and wood structures to make sure they are intact. You should have already been given the choices of what type of insulation you want to put beak in the attic by the attic insulation removal contractor. If not Go here to help make that decision: http://www.energystar.gov/index.cfm?c=tax_credits.tx_index The attic insulation should be installed to the Correct R-Factor that is recommended by the county you live in, if there is a question concerning the R-Factor and the county code, check with your counties code compliance office. When complete, you should have a secure, clean attic that is safe for you and your family. This type of work is Dirty and hot. Don’t trust just anyone with your families safety, call one of the qualified contractors listed by state on the left hand side of this page. You will be glad you did!! If there is no one in your area, please call your local health department to see if anyone in your area offers the unique service. Some Emails we get from this page concerning bat infestations. My name is Rhonda and I'm renting a home in washington dc that has been infested with bats. I moved in last October and didn't discover the problem until Spring. I got extremely sick and the doctors didn't know what was going on. I was treated for bacterial pnamonia. This was in February before I new there was an infestation. I'm in a situation where the owners of the home have hired a company to come clean the guano. The question I have is should I be in the home during this process? The company plans to do a section at a time. This will disturb the feces and cause it to go airborne correct? And if that's the case should we be running hepa machines for a couple days? I'm also concerned about my furniture and what kind of cleaning needs to be done in the home after. I spoke with someone months back with fish and wildlife. The gentleman said if you can smell the guano that means it's been building up for several years. I've had the room I use to stay in closed off since that's where the main infestation is. They are housing in the walls. I would be very grateful if you could give me some advice as a renter how I should be dealing with this issue. Also most important the health concerns I should be concerned about. A> Rhonda, thank you for the email about the bats in the attic, I am not permitted to offer folks that rent advice about a home we service, however you can have your landlord contact us a give us permission to speak with you and I would be glad to help with your situation!